The ozone layer in the high altitudes of the stratosphere is protecting humans and ecosystems against ultraviolet radiation. Ozone depletion raises UV (ultraviolet) radiation, and thereby the risk of skin cancer. Damage to the ozone layer by fluorinated hydrocarbons and similarly acting substances has already been considerably reduced by measures undertaken even before the damaging effect could be clearly proved by science. This is a success story for the application of the precautionary principle, and a model for mastering other global challenges. Affected people and foundations of life: Production and usage of substances, which are the main cause of depletion of the ozone layer, (CFCs and FCs) have been banned, and their usage is almost stopped (UN [United Nations] 2006, 17). 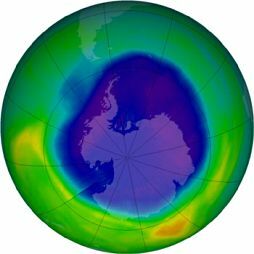 Nevertheless, there are long-term consequences and effects to the ozone layer by pollutants that have already been emitted, although the effects can not be clearly calculated yet. There are still risks, for instance, the ozone layer could be even further depleted in the next decades. Heightened ultraviolet radiation and the associated increase of skin cancer have to be taken into account, particularly in countries close to the Antarctic. The recovery of the ozone layer is not expected to happen before the mid-21st century (UN 2005). by 2010, Countries of the South shall have received improved access to alternatives to chemicals destroying the ozone layer (goal of the World Summit on Sustainable Development: UN 2002, § 39d). Trend: + Emissions in ozone-depleting substances were reduced from 1.5 million tons in 1989 to 89 000 tons in 2005. Hence the Montreal Target has been achieved to more than 90%. Concentrations of ozone-depleting chlorofluorocarbons (CFCs) have begun to recede in the atmosphere. (UN 2007, 24f. [and following page]) Without this strong reduction the additional greenhouse effect of ozone-depleting substances emissions would have equalled carbon dioxide emissions (UN 2008, 37). Measures: Problems are caused by some substitutes regarding, among others, the greenhouse effect. Significant amounts of CFCs continue to be produced and traded illegally. Management of stockpiles of ozone-depleting substances is another concern, since the costs of destroying them are high and environmentally unsound disposal methods could spew disastrous amounts of ozone-depleting substances into the atmosphere. (UN 2007, 25.) The Global Environment Facility (GEF) supports projects for the substitution of ozone depleting production processes in the South. UN 2005: The Millennium Development Goals Report 2005.